Want a Kennel Box that will Last Forever? 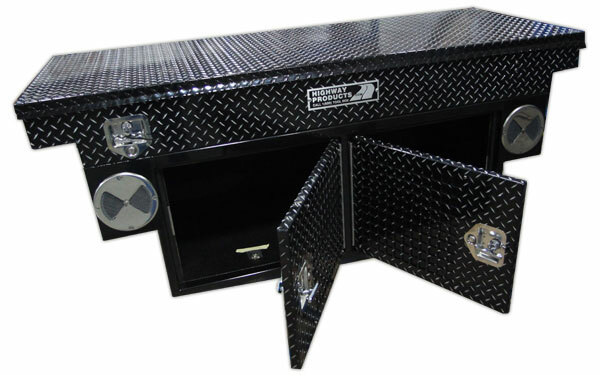 We use the same metal, locks, hinges, and components we make our legendary semi truck tool boxes with. You just don't get much tougher than semi truck. By popular demand, we've brought back our line of kennel boxes. We stopped making them for a while due to our production needs for our other products. But our past customers wouldn't have it. They told us they couldn't find kennels to compare anywhere else. So, we started making them again and we're glad we did. Take a look at our Vet Boxes. 30+ years of experience goes into each kennel box. 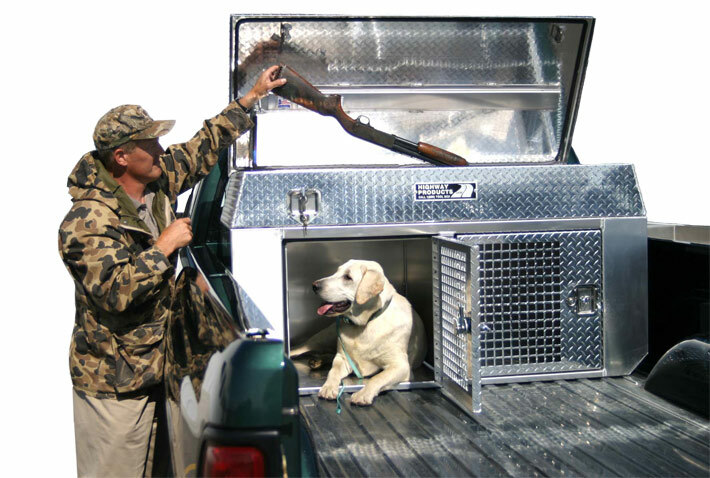 This box offers a secure, comfortable way to transport your animals. Room for two big dogs! The storage area on top is a great place to keep your guns and equipment. Plus, it acts like an insulator to keep your pets cool in the summer and warm in the winter. The reinforced top lid opens with a gas-assisted strut that keeps it open. 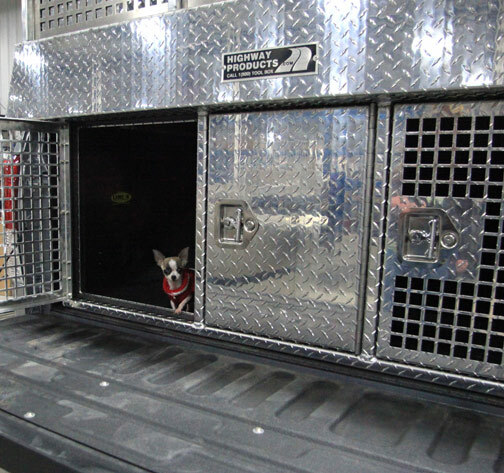 Doors open from sides for easy access to animals from the side of your pickup plus keeps animals separated if needed. 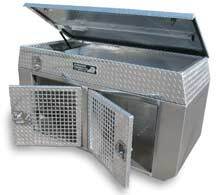 The high quality stainless steel tee-locking mechanism gives you peace of mind that your animals are locked up safe when you're not around. 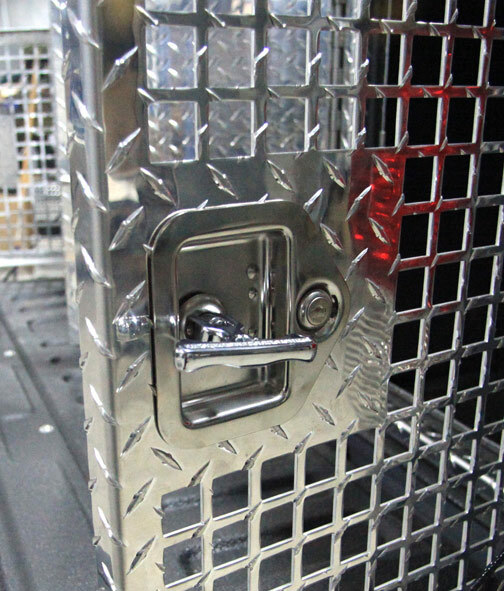 These are the same locks we install on our legendary semi boxes and are virtually crow-bar proof. .
Removable center divider for pet separation is standard. Manufactured from 1/10" marine grade aluminum. The thickest material you will find. Our boxes come with the industry's only lifetime warranty. We can offer this warranty because our skilled craftsmen use only top quality materials and manufacturing processes. Every Highway Products box is built with 30 years of pride. 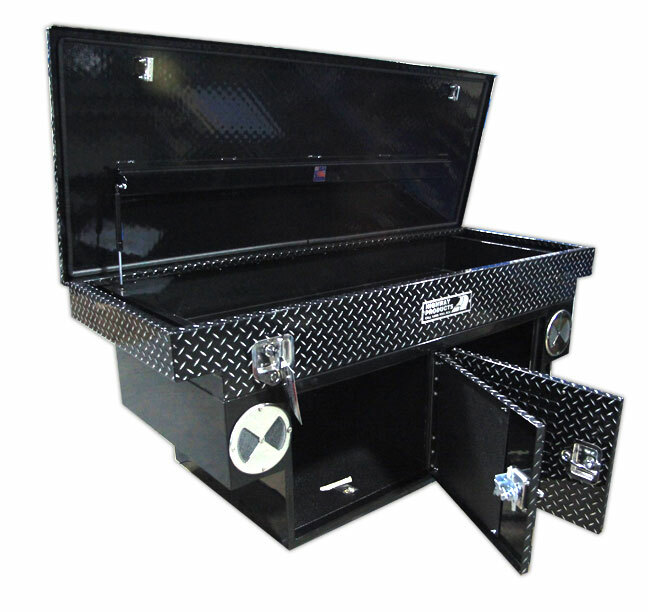 This unit fits inside the bed of your truck but can also be used on the ground and in the garage for storage. 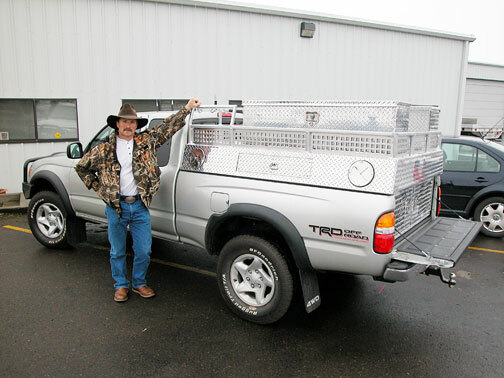 Has the same great features as the above Freestanding Box, but sits on the truck's rails and offers more top storage space for guns and equipment. This box offers a secure, comfortable way to transport your animals. Room for two big dogs! 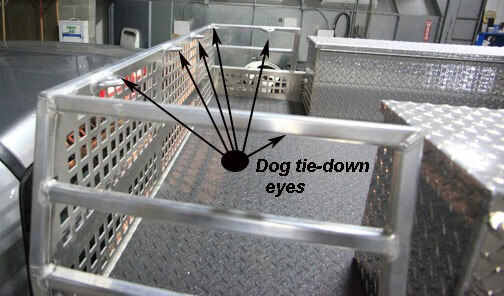 Doors open from outside to keep dogs separated and with the locks towards the outside it's easier to open from the side of the truck so you won't have to crawl into the bed to open it. Has the same great features as the above boxes. Sits on the deck of your bed. Can be used in vans and SUV's. 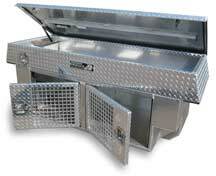 This lightweight and roomy box offers a secure, comfortable way to transport your animal. Handles on both sides make moving the box a snap. Sealed floor with a 3" lip contains any liquid spills to keep your vehicle's interior clean. 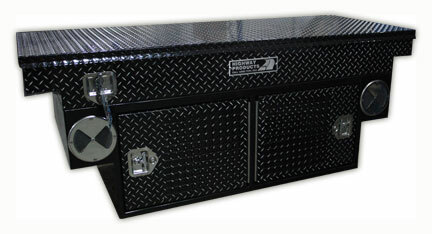 Same stainless steel locking mechanism as above boxes. Used in all types of vehicles. 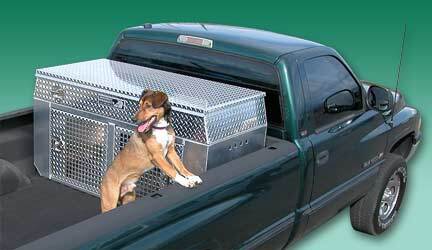 This lightweight box also offers a secure, comfortable way to transport your animal. Handles on the sides make moving the box a snap. Sealed floor with a 3" lip contains any liquid spills to keep your vehicle's interior clean. (above) This kennel box is powder coated gray to meet customer spec and has removable panels for winter/summer creature comfort. Special needs are part of our business. 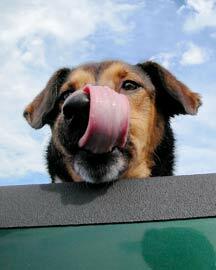 We don't mass produce our products, so we can offer more options that make your kennel work better for you and your dog. 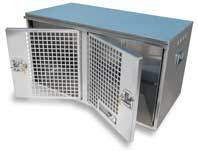 Our Super-Grade shaved diamond kennel is black powder coated and has extra vents so you can keep the removable panels on and still have ample ventilation for those days when the weather changes often. 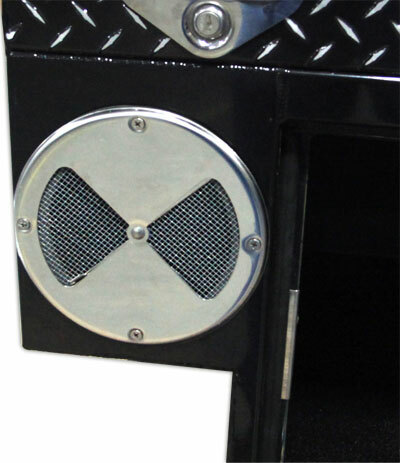 Notice the doors hinge from the middle, allowing easy access to the locking handle. 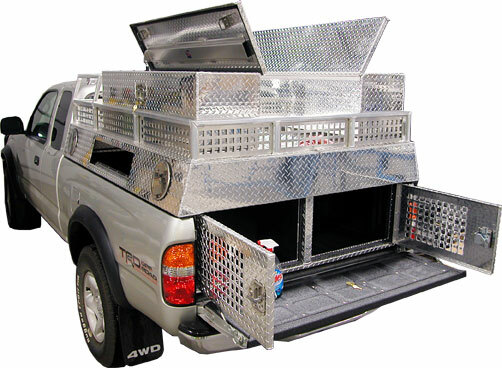 Lock or open the doors without having to get in the back of your pickup bed. 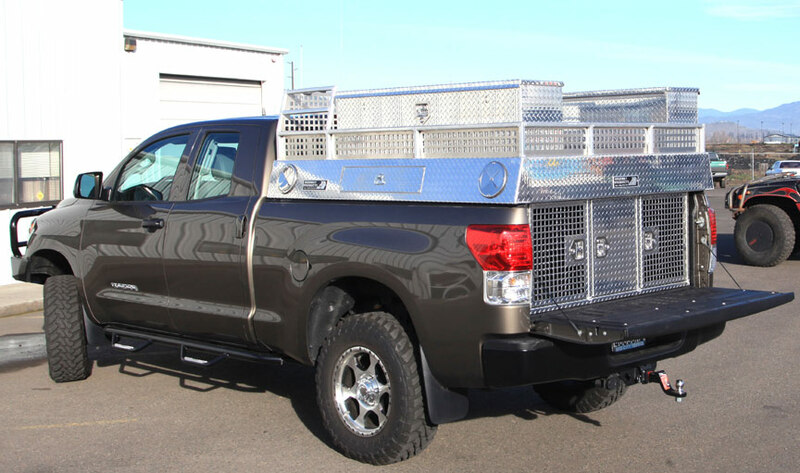 Adjustable stainless steel vents allow you to control ventilation simply by reaching over the side of your truck bed. Great for those days when weather is changing from hot to cold. 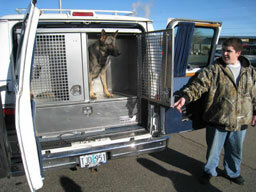 Here's a custom unit we built for a dog trainer. As you can see, it fits in the back of a full sized van and has room enough for two dogs and a drop door storage unit underneath. Run Hound Dogs? Check this baby out. This unit was designed by Houndsmen. Call and ask for more information. Want a Kennel Custom Made Just for You? Top compartments for even more storage. Great for overnight or longer camp-outs to other hunting grounds. 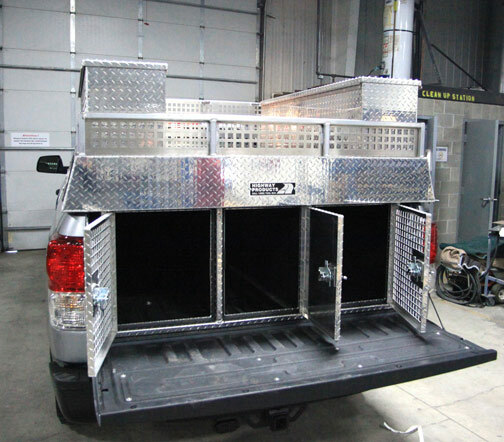 Rear compartments for dog and utility storage. Our kennels can hold even the meanest dogs. Mr. Bubbles has been known to tree cats ten times his size! Keep you valuable dogs under lock and key and don't worry about the door coming open during transit. Four (4) adjustable vents with a large vent door to help keep your dogs comfortable during summer or winter..
(below) Six tie-down eyes on this unit gives you plenty of places to secure your dogs on top. We don't stock our line of kennel boxes. They're made to order. So please give us some lead time to build them. We usually get them made pretty quick anyway. 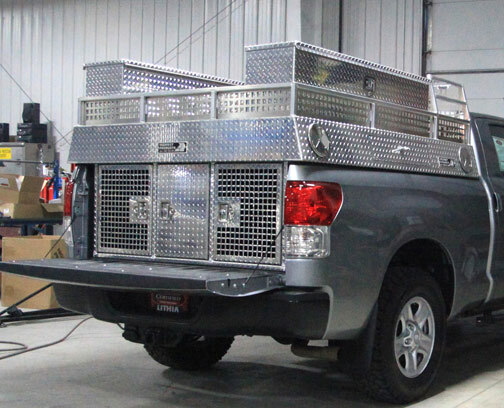 If you want a special size, take some measurements of your truck bed before you call so we can give you a quote. Parker belongs to one of our engineers, John Spencer, is a happy hound. Parker's advise: "You're going to have your kennel for a long time, get a good one." 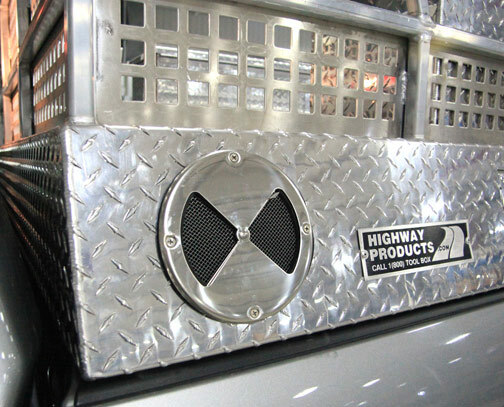 Call Highway Products for a price on your kennel box.